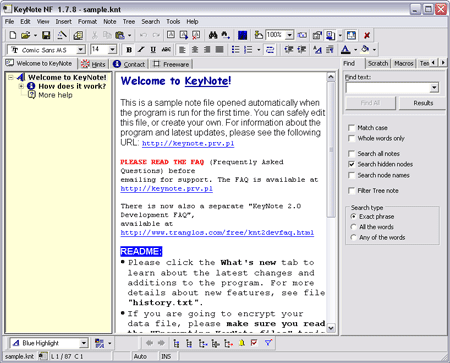 Keynote NF is a Free Portable Notebook that might also be used as a Portable Diary. Based on the original Keynote with New Features, this portable Notebook utilizes a RichText editor, built in search, and your Notes can be encrypted under file > properties using IDEA or Blowfish encryption methods. Other key features include: View/Tree check boxes on children of selected nodes, Show/Hide nodes, Unicode compliant, Multilingual support, and more.